The 350 Realm is the first in an exciting new model family for Boston Whaler. 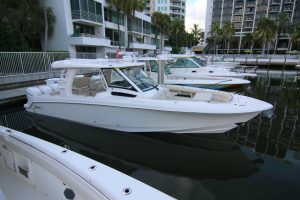 Combining the open cockpit of a center console with the convenience of a cabin boat, the 350 Realm is designed to empower boaters seeking to share new experiences with family and friends. The Realm offers a perfect balance of capability and comfort, spaciousness and convenience. Purposeful comfort is a hallmark as versatile seating solutions exist throughout. The large open bow features a portside walk-through for easy access, with a wide lounge seat forward of the console and forward deck seating opposite. Every seat on the helm deck includes a footrest and the helm bench offers ergonomic positioning for the captain and passengers, and turns to face aft. In addition, below deck the cabin delivers considerable comfort. Performance and handling reflect Boston Whaler’s unrivaled construction and engineering. The Realm’s precision-crafted V-hull includes Variable Running Surface for a remarkably soft, safe, dry ride, no matter the conditions.